Got your grains of salt at the ready? Good. Rumors of a more extravagant Chromebook have been making the rounds for months now, but the new, supposedly leaked video the new touch-friendly Chromebook Pixel may provide the first real glance at what Google has been working on behind closed doors. The video was spotted by Chrome buff François Beaufort, and it certainly looks flashy enough — it exhibits and level of polish and clarity of message that’s notably absent in most fan-made mockups (though some of them are getting very good). The video doesn’t offer much in the way of hardware specifics aside from noting that the display plays home to 4 million pixels, which Beaufort believes means a screen resolution of 2560 x 1700. For what it’s worth, the information laid out in the leaked video jibes with some earlier reports of a touch-enabled Chromebook. Last November, the China Times claimed that Google was planning to launch a Chromebook with a 12.85-inch touch display, and noted that the search giant (and not a hardware partner like Samsung or Acer) had placed orders with ODMs Compal and Wintek. The implication at the time was that Google would be bypassing its usual slew of hardware collaborators completely in favor of crafting and selling its own gadgets. 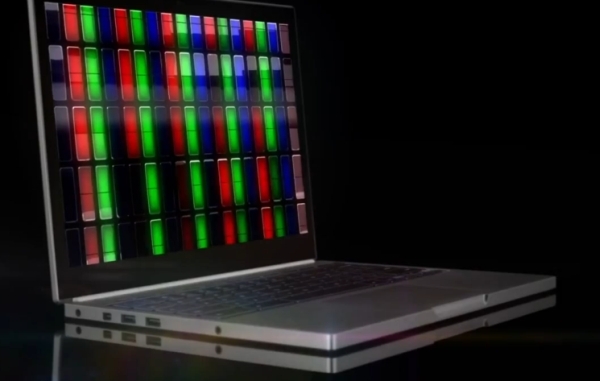 Interestingly enough, the Chromebook Pixel video states that it’s a new kind of computer “designed entirely by Google,” suggesting that Google may have done just that. Naturally, Google declined to comment when asked if the Chromebook Pixel was indeed a real product. But why would a company working on what appears to be a fairly static visual guide have access to a promo video for unreleased Google hardware? Well, it would seem that part of the team’s work also involves crafting promo videos like these pro-Google ads that were uploaded to their collective Vimeo account this past week. None of them seem all that high-brow — not nearly as much as curious Chromebook Pixel promo anyway — but they hint at some sort of working relationship between Google and Slinky.me. Adding fuel to the fire is Slinky.me’s CEO, one Victor Koch who claims on his LinkedIn account that he is (or was, if he’s not the type to update regularly) a software engineer at — you guessed it — Google. A quick look at his Facebook profile seems to shed a bit more light on the situation, as he refers to himself there as an “ex-Googler.” We have been unable to confirm with Google that Victor Koch was a former employee, and Mr. Koch wouldn’t respond to the Facebook messages I’ve sent him so for now this facet of the story is still a bit murky.